I hope that you enjoyed part 1 of my year in review yesterday. I teared up a few times already writing this Year in Review post and can't wait to see what 2015 brings. We enjoyed some bonfires at the farm all summer. I shared some pregnancy reflections. July 26th- My mom, sister and sister-in-law threw us a great baby shower. 29 weeks pregnant- My sister took our maternity photos at the farm. Part 2 maternity photos. And I made a pregnancy in 30 seconds video. September 13th- 1 week before Adalyn was born, this huge preggo hung out at a nightclub for my sister's 21st birthday. September 18th- Went to Thai food with my mom and sister the afternoon before I went into labor!! September 20th- BEST DAY OF MY LIFE!!! Adalyn Grace Hernandez was born at 12:33 PM weighing 7 lbs 0.5 oz. I shared Adalyn's birth story over 2 parts. And shared how she met the family. September 27th- When Adalyn was 1 week old, we had the family over for tacos and got a group picture of the 4 generations. I shared how life was at home with a newborn. On my maternity leave, my mom, sister, Adalyn and I went to downtown Detroit and walked around Campus Martius. I got very personal by sharing 10 Surprises as a New Parent. I shared another very personal post in A Letter to the Newborn Mom. These were two of my very favorite posts ever on The Nutritionist Reviews. Adalyn got to see the farm! I seriously cannot wait to show her the farm more once she can understand. November 20th- After missing a 1 month update (whoops! 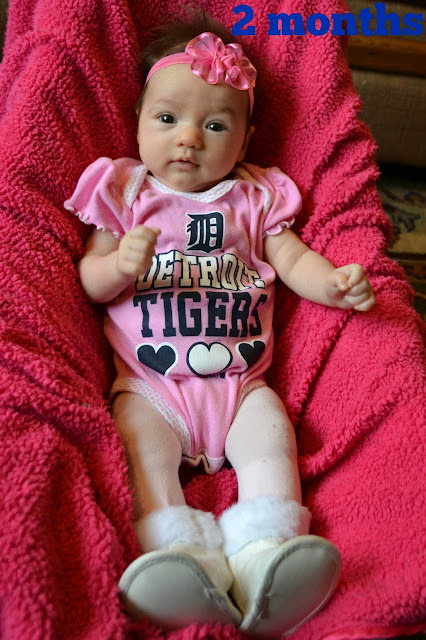 ), I shared Adalyn's 2 month update. And I turned 25 as well. November 27th- Adalyn celebrated her first Thanksgiving! December- I took about a million photo shoots of Adalyn around the Christmas tree. Very exciting to celebrate our first Christmas with Adalyn. This year has been incredible! I hope you enjoyed this update of the top moments from 2014.